Everyone has a pack of coloured felt-tip pens hanging about at home, but what can they be used for apart from colouring in? Well, I’m reviewing a book that is going to show us, Creative Marker Art and Beyond by Lee Foster-Wilson. Keep reading for some felt-tip tips! To quote the blurb ‘Inspiring tips, techniques and projects for creating vibrant artwork in marker’ In this very colourful book you’ll find basic information on colour theory and how to use coloured felt-tips (or markers, if you prefer!). As well as a range of different projects using the techniques you’ve learnt. Creative Marker Art and Beyond is split into experimentations, creative prompts and projects. The exercises teach you about the different types of felt-tips and various ways to use them as drawing tools. The creative prompts expand this to give you a chance to practice these techniques in a fun way. These include filling a page with marks, using two colours to make a pattern to practicing fonts and drawing flowers. I am very impressed with the projects, all of which make me want to cover everything in doodles! Projects include using paint pens to draw on rocks and mirrors, decorating glass frames and chopping boards to using alcohol with pens to create a mandala. I used to draw all the time, but haven’t done anything for a while. With this in mind, I decided to start with some of the basic drawing exercises at the start of the book. One of the first exercises in the book is to look at nature. I chose a leaf, my next task was to draw it in as much detail as possible. Unless you have a massive set of pens, you have to be creative with colours for this task! 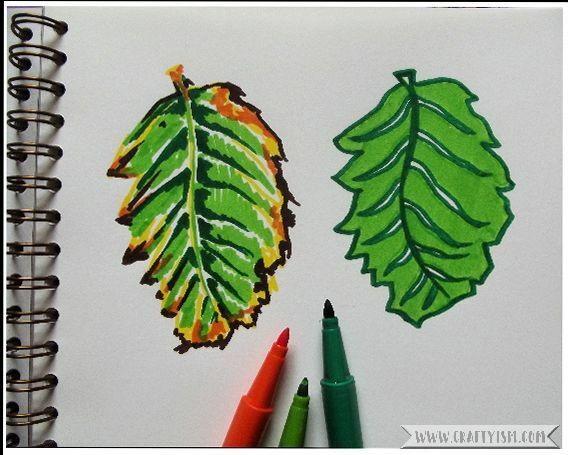 Then, using this drawing as a guide, I had to create a new, much more simplified version of my leaf. I love how this task quickly shows how versatile these pens are, it just depends on how you use them, and what sort of look you are after. Another exercise I enjoyed was drawing negative space. This means that instead of using lines to draw an object, you block in colours around it, creating the object in the blank space. Lee Foster-Wilson suggests doing this by cross hatching the space around the thing you want to draw, then going back and adding some simple details. It’s a fun technique that I think looks really effective. 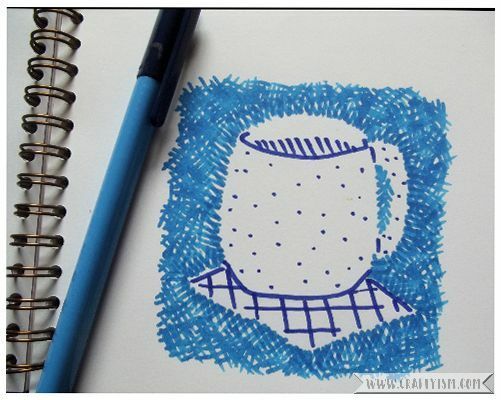 This tea mug that I drew might be good as a simple card topper perhaps? Would I recommend this book? A big yes! It’s bright, colourful, informative and instructional. A lot of the basic exercises were colour and drawing lessons that I learnt at art school, so if you are a beginner, it’s well worth working through those to give you confidence in your drawing technique. I am really impressed with the projects and can’t wait to try paint markers on a mirror and using rubbing alcohol to blend felt-tips on fabric. Overall, Creative Marker Art and Beyond has everything I’m looking for in a craft book; it’s informative and very inspirational. I was given a digital copy of this book to review by the publishers. All thoughts and opinions are my own!